Men should not use it on their face due to the density of facial hair. The Remington iLIGHT intense pulsed hair remover is a safe and pain free solution to hair removal for your face and body*. Throw away your razors and your waxing strips and you could enjoy permanent results in just three treatments**. Simple enough to use at home and effective enough to replace those weekly trips to the salon, this product lets you be hair free to do what you want. The intelligent multi-flash function allows you to be permanently hair free after just 3 treatments*. Simply treat the desired area of your body once, in 2-week intervals, for just 6 weeks***. Before purchasing, our skin tone sensor checks that your skin is suitable for IPL treatment, guaranteeing you get the desired results.. Choose from five settings allowing you to select the strength that is most comfortable for your face and body. ** Individual results vary. 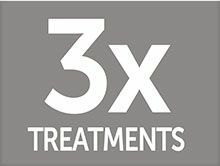 In clinical testing on the body, treatment sites showed up to 94.3% and on average 66% fewer hairs twelve months after just three treatments. Similar to results observed from professional hair removal devices. Permanent hair reduction for the face & body*. * Only suitable for female facial use below the cheek bone. Facial hair can be very different to body hair and the skin on the face tends to be sensitive and more likely to be exposed to the sun’s UV rays; therefore treating unwanted facial hair is different to treating the body – please be sure to read the Warnings and Safety Precautions carefully before beginning a facial treatment. IMPORTANT: The Facial Attachment has been specially designed to treat the unique characteristics of female facial hair. DO NOT use the Body or Bikini Attachments on the face. See section ‘Changing Attachments’ for more information.